Today I’m loving … these garden chairs from Anthropologie. 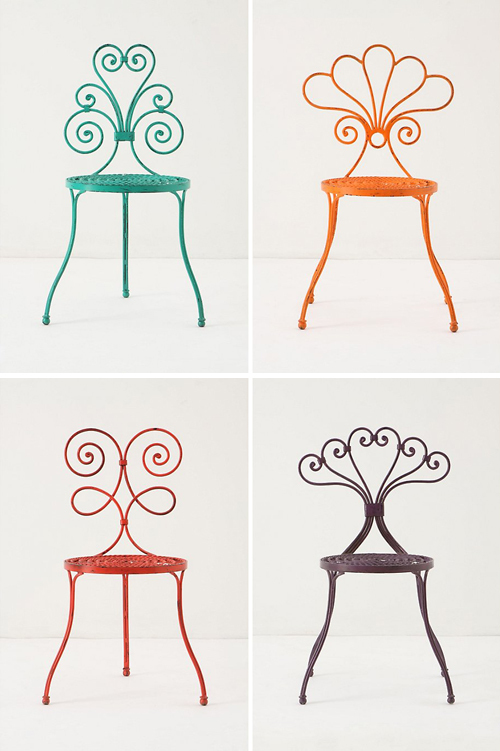 The chairs, designed by David Le Versha, are inspired by the designs of traditional wrought iron fencing. Skikkelig fine men de ser ikke så innmari komfortable ut må jeg si! Haha, it is too early for me, let me try that again in english! I agree with Signe, they look extremely uncomfortable 🙂 but would look nice especially when you have all the different colours and shapes in one set. cute, one of these would look so cute out in the garden. I love the orange one. They’re adorable and would make for great conversation starters but I’m not sure I’d actually like to sit on one! I love these! The colors are fabulous. They would be perfect to brighten up a dull patio or back yard! cute cute chairs. would love to have these out in my backyard enjoying our view with a cup of tea in the states. These garden chairs certainly brightened up my rainy day here! <3 anthropologie and your blog! aww, the chairs are lovely! I agree…cute and whimsical. They would be perfect for an entry or corner. Love the colors! oh, such cute chairs! ?